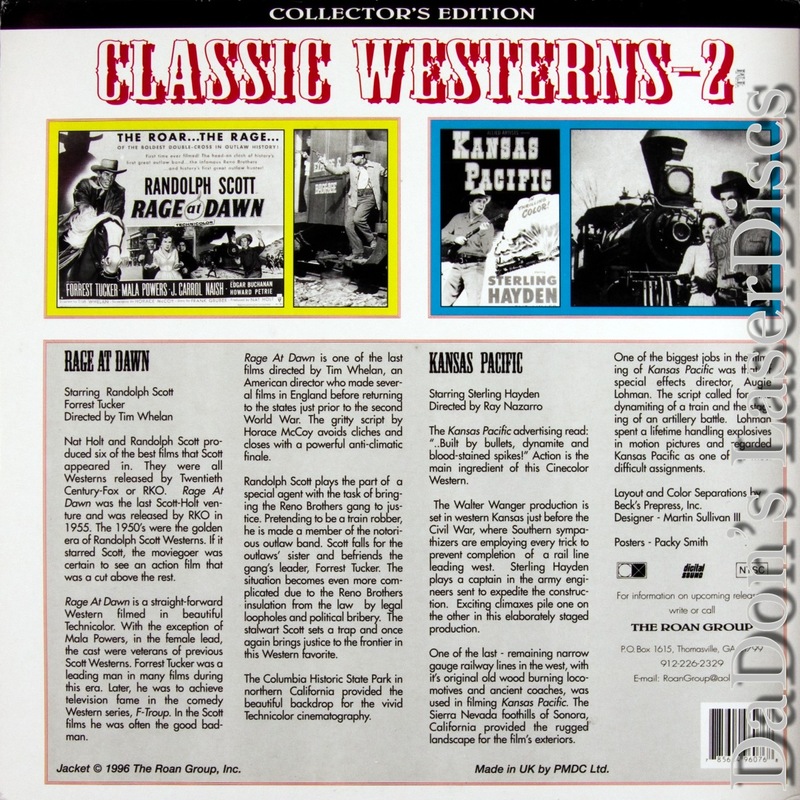 Rage at Dawn Kansas Pacific 1955 - 87 min. 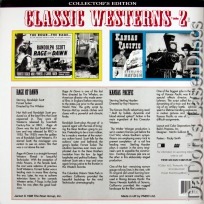 - Color Genre: Western Not Rated Country: USA LaserDisc Movie Review: Before the James and Dalton gangs terrorized the Old West, the Brothers Reno robbed banks and ruled their small town. Until a pair of undercover investigators infiltrated their ranks. The Renos -- Frank, John, Clint and Bill -- roamed Indiana and stole other people's money, always returning to the village where they lived and controlled the puppet-like system of law enforcement. Then two federal agents, James Barlow and Monk Claxton, entered their town, posing as railroad bandits. They ingratiated themselves into the Reno gang and soon started to wreck it from within. However, the final -- and harsh -- "justice" may be carried out by the beleaguered townsfolk, who are just praying for bloody vengeance... --- Second Feature --- --- Feature Number 2 --- Kansas Pacific 1953 / 73 Minutes / Color Not Rated Though the Civil War has yet to start, the conflicts have already risen to the surface. In the 1860s, railway employees do anything to postpone work on the Kansas Pacific line because they side with the Confederates in the budding War Between The States. Meanwhile, those partisan to the North step up progress. Then the U.S. Army assigns an engineer, John Nelson, to the tracks to see the project to completion. Nelson does not realize, though, that he has just stepped into a microcosm of the brewing battle that will ultimately pit brother against brother. Thanks for Visiting DaDon's Rare LaserDiscs ! Reviews, Articles, Newsletter and Information for Movies on LaserDisc LD Laser Disc, LazerDisc.